History: Cotton is included here for completeness. Not as strong as hemp, it is a poor substitute when strength is required. However, cotton is soft and can be bleached white. It makes very attractive decorative rope for purposes such as handrails, drapery pulls, and bell ropes. History: Before the advent of synthetic fibers, industrial, marine, and climbing ropes were made of hemp that, for durability, was soaked in pine tar. The fiber comes from Cannabis sativa, a variety that, in marked contrast to Cannabis indica, yields only minute amounts of any psychoactive drug. Hemp fiber is one of the longest and strongest of the natural fibers. From The Classic Yacht Symposium 2006 in his “History of Rope” Bill Fronzaglia writes “…it was known that Hemp retains more strength when the yarn is twisted to the right. This resulted in a left hand strand, and a right hand rope. It wasn’t until modern times that microscopic examination of the plant illustrated that the structure of the plant has a natural twist that causes this effect.” This explains why Left Hand Strands twisted together as Right Hand lay (“Z” twist) make stronger hemp rope. Unfortunately, Fronzaglia provides no link to this interesting piece of research. History: The Polyamide 6,6 (Nylon® – by Dupont) and Polyamide 6 (Perlon® – IG Farben) were developed in the late 1930’s. Nylon® was first introduced in 1939 in the form of stockings. They were an overwhelming success. Almost immediately, however, the requirements of World War II consumed the available supply and Nylon® stockings vanished until 1946. The name Nylon® embraces a number of related compounds. The variants usually used for manufacturing rope are Nylon 6 and Nylon 6,6. Their properties are almost indistinguishable except for a small difference in melting temperature. Progress: The introduction of Nylon® rope represented a huge advance: dock lines never wore out and nor did the lashings between shroud and the shroud plate; splices merely required one or two additional tucks; and, melting a rope’s end provided a quick, temporary “whipping” which was at least good enough to get the customer to take his new purchase out of the shop. Properties: Of course Nylon® stretched (about 10% elongation at 30% of breaking strain) – but then so did the natural fibers – and for many purposes this was acceptable, even an advantage, e.g., for yacht anchor rodes, dinghy painters, and dynamic climbing ropes. And, although soaking weakened Nylon® rope by 10 – 20%, this was reversible and seemed unimportant because Nylon® didn’t deteriorate with age and was about twice as strong as the natural fiber it replaced. Nylon® has a relatively high density; it melts before it carbonizes and the end of a rope can be fused using heat. It exhibits some creep under high loads and has good resistance to ultra violet light. Mooring Line Hazard: Elasticity appears to be an attractive property for mooring lines on small yachts but presents a major hazard on large ships. The end of a broken Nylon® hawser recoils with enough contained energy (“snapback”) to maim or kill (several deaths are on record). In addition, Nylon’s high density makes it sink – a hazard to a ships’ propellers. For these reasons, HMPE (below) is now preferred for mooring lines on large ships. History: The Polyester, Terylene®, was developed by Imperial Chemical Industries in 1941. The rights were purchased by duPont in 1946 who subsequently developed the related similar fiber, Dacron®. The introduction of Dacron® rope in 1953 changed things again. The practical benefits of Nylon® were retained with the critical difference that elasticity was markedly reduced. In 1957 Samson introduced the Double Braid construction, and Dacron® ropes were rapidly adopted for halyards, sheets, and static climbing ropes. Properties: Dacron® ropes stretched much less (about 3.5 – to 5% elongation at 30% of breaking strain) and were not weakened by water. Like Nylon®, Dacron® has a relatively high density and does not float. It also melts before it carbonizes and the end of a rope can be fused using heat. It exhibits negligible creep under load and has excellent resistance to ultra violet light. A chemical group which includes both polypropylene and polyethylene. When describing rope, polyolefin may refer to a mixture or to either one of these fibers. History: Polypropylene was first synthesized in 1954 and produced commercially from 1957 onwards. Properties: It has a low melting point and is degraded by ultra-violet light. However, it floats, absorbs no water, does not shrink when wet, and is inexpensive. It is widely used as a light-duty pulling rope by contractors and as a rope for recreational purposes such as water-ski towropes. It is usually made of large diameter fibers that are easily damaged by abrasion. Melting the ends is easy but provides limited protection from fraying because damage readily separates the fibers from the melted end. History: Polyethylene was first synthesized in 1933 and produced commercially from 1939 onwards. The fiber used in rope is similar to Polypropylene but slicker with better abrasion resistance and a lower melting point. It also floats and is most commonly found in small diameters. e.g., as a water-ski towline. It is used to make nets and is widely used in the fishing industry. First described in 1968, carbon fiber exhibits very high tensile strengths – but has not proved suitable to make rope: the high theoretical strength is lost during manufacture into rope and braiding has not proved satisfactory. It has been used as a high-tech sail fabric, to reinforce concrete, and in support stays for cranes and towers but not for the crane’s running cables. High Modulus Polyamide was introduced as Kevlar® (1973), Twaron®(1978), and Technora® (1976). These heat resistant fibers have long chain molecules highly oriented in the axis of the fiber. They are best known for their use in body armor fabric. Properties: Aramid fiber ropes are also used in the heaviest marine applications, e.g., 6-1/8″ (156 mm) diameter Technora® with a breaking strain of 3,000,000 lb (13,300 kN). They are unaffected by water, exhibit some creep under continuous load, and are about three times stronger than Nylon®or polyester of the same weight. Typical elongation is about 1.2% at 30% of breaking strain. Melting cannot be used to fuse the ends and these fibers sink in water with a density (1.43) similar to that of Nylon® or Dacron®. Introduced as Spectra® (1975) and Dyneema® (1979), the HMPE (High Modulus Polyethylene) fibers are composed of exceedingly long molecules with a molecular weight in the 2 to 6 million range. The fibers are tough (excellent abrasion resistance) and slippery (very low coefficient of friction), but kinking or compression damages them relatively easily. Properties: Melting point is relatively low (144 to 152°C or 291 to 306°F) and operating temperatures should not exceed the boiling point for water. HMPE fibers are very resistant to water, moisture, most chemicals, and UV radiation (retaining 60% of its breaking strain after five years). Ropes are typically 40% stronger than Aramid fibers of the same weight and, with a specific density around 0.97, HMPE ropes float in water. Problems: The strength of HMPE rope is its distinguishing feature. The challenge is to maximize this strength safely and effectively. HMPE fibers dislike compression and kinking, and the rope is strongest when the fibers are almost parallel to the rope’s axis. These constraints explain the widespread use of un-sheathed, loosely woven, hollow braid ropes with 8, 12, 16, 20, or 24 strands running in pairs. This construction delivers most of the fiber’s inherent strength but it also exposes the problems. Sharp angles and knots can weaken the rope by 70% to a mere 30% of its breaking strain and usually trusted knots slip undone easily – at loads as low as 15% of the breaking strength. Solutions: The Long Bury and Locked Brummel both create secure eye splices that achieve 90 – 95% of the ropes’s breaking strength. When a knot must be tied it should be stitched for security. Some knots work better than others: the Double Fisherman’s or, even better, the Triple Fisherman’s, can be used to join two ropes and the Buntline Hitch makes a secure attachment to a sail or shackle. HMPE rope has excellent abrasion resistance but, if more protection is required, a segment of the rope can be slid over itself as a sleeve. This High Modulus Polyester, LCAP (Liquid Crystal Aromatic Polyester), was introduced as Vectran® (1990). Vectran® is somewhat similar to the Aramid ropes but has a high melting point. Vectran® exhibits no creep even at high temperatures loaded to 50% of its breaking strain. It tolerates kinks, bends, and knots better than the HMPE ropes and exhibits good knot holding properties. Properties: Melting point is 330°C). LCAP fibers are very resistant to water, but poorly resistant to ultra-violet radiation. Typical elongation is about 0.77% at 30% of breaking strain. With a specific density around 1.4, LCAP ropes sink in water. The values below were mostly obtained from Barry Cordage’s Document # 080315E (Technical Properties of Synthetic Fibres) and were obtained from each manufacturer’s data in the public domain. Like Barry, we make no representation as the exactness of the data. If you have additional or updated information, please Contact Us. 250 – 400 360 230 400 90 – 95 110 50 – 75 ? ? ? 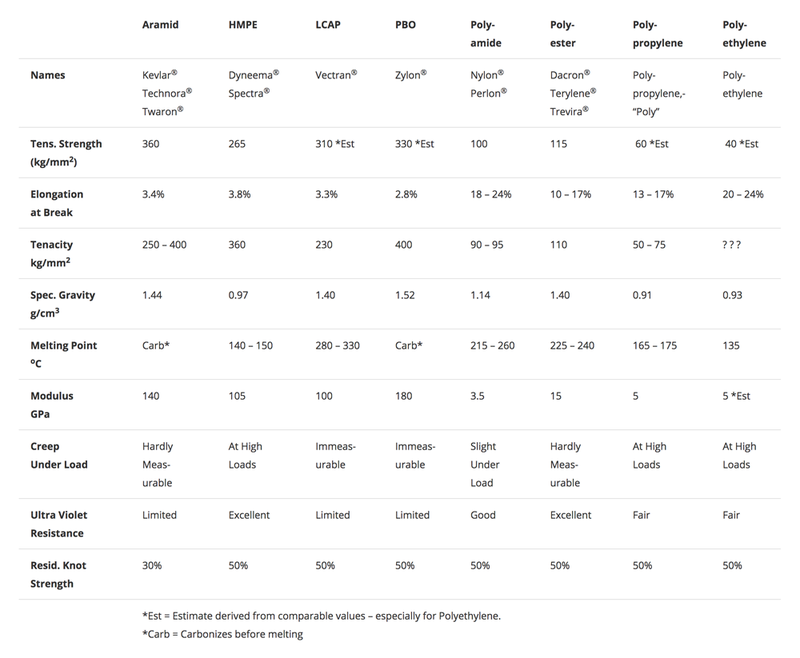 *Est = Estimate derived from comparable values – especially for Polyethylene.